Where did the Devon Rex breed originate from? The Devon Rex cat breed first originated through an accidental mating process between a straight-haired female and a curly-coated male. 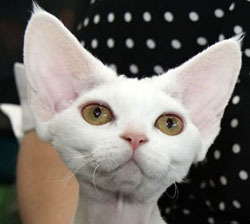 This kitten, Kirlee, was eventually bred with Cornish Rex female cats, resulting in all straight-haired kittens. It was thought that a genetic mutation caused Kirlee’s distinctive curly coat, and that this was separate to the gene that caused the Cornish Rex to have a curly coat. The name of this breed of cat was called Devon Rex (Devonshire Rex) because the very first cat born to this breed, Kirlee, was born in Devon, England. Eventually, when these cats were taken to the USA, and bred there the American Cat Fanciers Association recognized them in 1972. Devon Rex cats are quite smart and are extremely active and playful. They are affectionate, and will love spending lots of quality time with their owners. They love attention and can often be found showing off. They can become easily bored and therefore you need to keep them occupied so they don’t get into trouble while they explore their surroundings. They are best kept as indoor pets. These cats have a slim yet muscular body. It has a wedge shaped head and big ears. The cats are mostly medium in size, but a few have a small appearance. 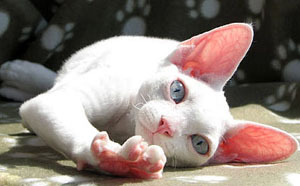 The most unique characteristic of the Devon Rex cat is its curly fur that comes in many colors and patterns. The short fur that this cat has, means that is needs little grooming, and is less likely to bring about allergies in people. very cut love them! also i love this site!